What does Christian Community look like? Well, one of the most vibrant, real, honest and growth producing communities I have ever been a part of looks something like this. 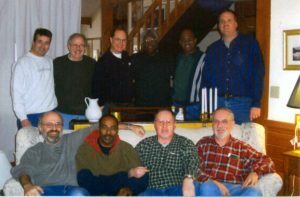 When I was serving as a pastor in MA there was a small group of pastors who made the decision to get together once a month for the sole purpose of talking about our personal spiritual lives. You may be thinking…isn’t that what pastors do all the time? Honestly it is one of the hardest things pastors ever do. Ask them about their church…they talk for hours. Ask a question about the new program, ministry plan or church growth initiative and they are off to the races. Ask about the latest book they have read and you better be ready to sit and listen for a while. Ask, “How have you experienced the presence of God in your life the past month?” or “How are you personally doing as you seek to grow in your relationship with God?” Well, the room can grow very quiet…very quickly. This group of guys along with a few others made a very conscious decision to set aside one afternoon each month to get together for the sole purpose of building community and asking, “How are you doing in your pursuit of deeper, growing relationship with God?” There were times of laughter, tears, argument, questioning and above all there was honesty…a brutal honesty that made our time together special. We hired Kit to serve as our spiritual director to help guide our times. His work was not easy. Providing spiritual direction to a bunch of pastors is a lot like herding cats. He never gave up on us and in the end helped us grow in our relationship with God and each other. 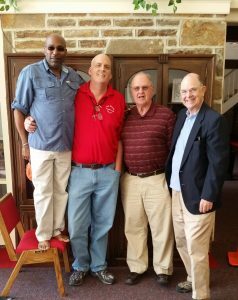 Willard, Dan, George and Tom in Kennett Square this week. When these guys found out I had Cancer their question to Nancy was, “When can we come visit?” They drove down from MA. We had a special time Wednesday afternoon, catching up on life. It had been over eight years since we last sat down together but it was like all those years did not exist. Our time together felt as if we had met each month for the past eight years and had never been separated. 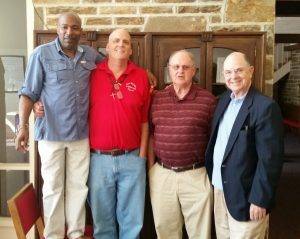 There was a time of prayer and these men laid their hands upon me and prayed healing and blessing, strength and peace upon my life. They prayed for my family, for Nancy, Rayann and Joseph. They prayed for First Baptist of Kennett and for wisdom as we walked through this season. We went out to dinner and we laughed as if I was not sick. We caught up on life. We shared stories from the past…some that probably should not be shared, especially in front of my daughter. 🙂 This morning we gathered for breakfast and once again it was like we had never been apart. It was good to see them. I was reminded why every place I have gone over the past ten years I have tried to recreate this group. I have failed. There was no way to replace the hole that was left in my life when this community was no longer near me. They are special people. Each one for different reasons. “On paper” we probably do not belong together, we are an odd conglomeration of theology, life experience and ministry focus. Yet when we got together, got out of the way and allowed the Spirit to work and move in our lives God did something amazing and very special. I will be searching for a “Band of Brothers” like this to walk with till the day Christ calls me home. Thanks for coming to encourage and lift me up. You can do it like nobody else! So glad that they got down to see you. I do regret that I could not be with them. As you said, it was (and for me still) a great group of guys. It is what every pastor needs and should take advantage of. I am praying for you and your family, as well, as you go through this very trying time in your life. Miss you, man. Dan, I would quickly say, our group is not the same without you; yes we get together and share our “stuff”, not as often as we did in the past and perhaps not as deep as when you would ask the hard questions. We miss your leadership and vision of what our little community could, should be. What a joy it was to be with you, Nancy and Rayann. If we brought some comic relief for a moment, we are glad. If we brought hope for the future we are grateful. If our healing hands and prayers infused by the Spirit earadicate the cancer, we are only being faithful to God’s call on our lives. We love you Dan, and believe God has a plan to use you and your life experience’s in a powerful way to build his kingdom in that little corner of Pennsylvania.